Black Triangle OG is a lovely Indica Dominant cannabis strain that's a real nice edition to the kush lovers choices. Combining the spicy pepper aroma of black domina with the earthy pine and sour lemon of the OG Kush makes this strain very interesting indeed. The genetics contained in this strain reach far with it having Northern Lights, Afghani, Ortega, Hashplant, Chemdawg and Hindu Kush in the mix. Most of these strains are from the Indica regions of the world being Northern India and Afghanistan. 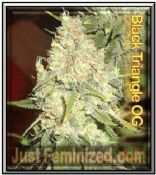 Black Triangle OG can be successfully grown by anyone and connoisseurs will also enjoy perfecting this cannabis strain. This easy growing marijuana plant will grow to a medium height finishing around 70-90cm tall. The buds are very dense with a grape like structure and the smell is a lovely pungent Kush with a good mix of aromas. Black Triangle Kush is great for pain relief and for those who find it hard to switch their brains off. This one will get you nicely chilled with its long lasting effect those reminiscent of a very potent form of hashish.